How Do I Get Pollen Out of My Pool? Spring is the return of pool season, which is our favorite time of year, but in some areas of the U.S., the blooming season also brings on pollen. Trees like oaks, elms and pines can create a lot of pollen blooms that can fall into your pool water. This may cause your pool to take on a yellow or greenish hue. The difference between pollen and algae is that algae will stick to the pool walls while pollen will collect on the surface. If left untreated, pollen dust can affect your pool’s chemistry and even cause staining over long periods of time. Below is a list of tips on how to combat the invasion of pollen. Which pool chemicals fight pollen? 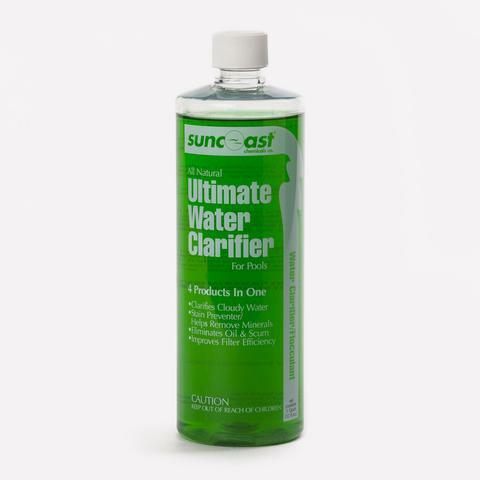 For help fighting pollen, we recommend Ultimate Water Clarifier. This all-natural clarifier will coagulate the organic materials in the pool regardless of size, including pollen. After the clarifier has bound these small pollen particles together, your pool filtration system will do the rest, making these particles large enough to filter out. Use a vacuum or automatic pool cleaner to clear up anything that settles on the bottom, then brush the tile and water line to loosen up any stuck-on pollen. What tools do I need to get rid of pollen? The best tool to fight pollen in your pool is a fine mesh skimmer net. This type of skimmer will collect extremely small particles and should help pick up most pollen. Skimming your pool a few times a day will help immensely. You may need to run your pump more than normal during periods when pollen is heaviest. This will help your filter pick up as much debris as possible. Be sure to check your filter’s pressure gauge and clean the cartridge filter elements or backwash your sand or D.E. filter when the pressure reads 10 psi over the normal operating level. You can also use a skimmer basket liner to help catch pollen before it reaches your filter. How can I prevent pollen from getting in my pool? The most effective tactic is to install a pool cover for whenever you are not using your pool during Springtime. This will cover the entire surface of your pool and prevent pollen from getting in. As a bonus, it will also help your pool to retain heat. In conclusion, while you can’t stop pollen from forming, you can prevent it from becoming a problem for your pool. If you have questions about which products are right for you, contact your local Pinch A Penny. 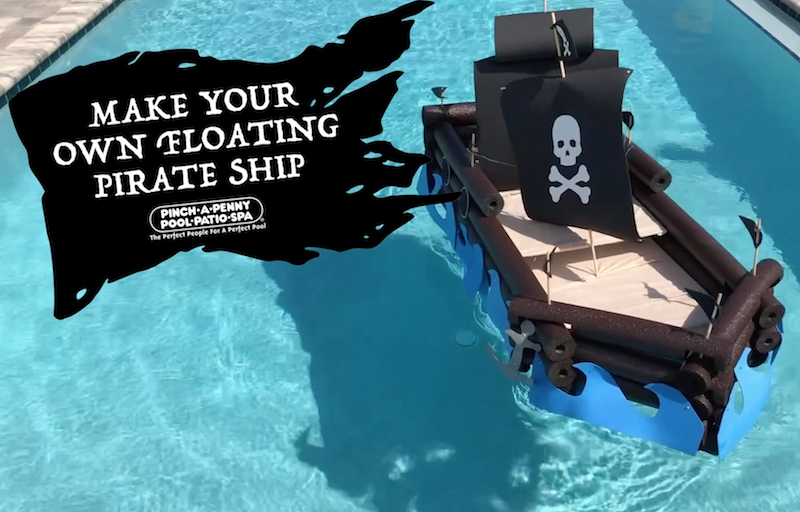 DIY Floating Pirate Ship Set sail for the High Seas in your backyard!